The global beer and wine distributor approaches borrowing in a manner that's all but gone out of fashion. A sampling of Constellation Brands' Mexican cerveza (beer) portfolio. Image source: www.cbrands.com. In June 2013, Constellation Brands, Inc (NYSE:STZ), already a serial acquirer of smaller wine and spirits companies, initiated a massive transaction with Anheuser Busch Inbev SA (NYSE:BUD) to reposition its portfolio for future growth. The company acquired the remaining 50% interest of its beer importing joint venture with Anheuser-Busch Inbev subsidiary Grupo Modelo. It also acquired Grupo Modelo's advanced brewing production facility located in Piedras Negras (Nava), Mexico -- 10 miles from the Texas border. Finally, it purchased perpetual rights to market and sell Modelo's highly successful beer brands in the U.S., including venerable names like Corona, Modelo, Victoria, and Pacifico. The total price tag for the "Beer Business Acquisition," which is how Constellation Brands referred to the three separate transactions, ran to $5.2 billion. This was a considerable amount, considering that the company's total stockholders' equity was only $2.9 billion in the year before acquisition. The massive purchase changed the complexion of Constellation Brands' business. Net revenue in the company's most recently completed fiscal year of $6.7 billion is more than twice that of the $2.8 billion of net revenue recorded in the year before the purchase (fiscal 2013). And net income from last year of $839 million is similarly more than double that of fiscal 2013's net income of $388 million. Shareholders have been rewarded by the sheer earnings power of the new model, which is now fairly well diversified between beer (53% of total revenue), and wine and spirits (47% of total revenue). Constellation Brands' stock has climbed more than 150% since the completion of the sprawling transaction on June 7th, 2013. But what about the growing magnitude of that debt? Constellation's capital expenditure requirements haven't subsided -- quite the opposite. In relation to the Modelo deal, the company is in the midst of completing a regulatory-required expansion of its Nava brewing facility from 10 million hectoliters to 20 million hectoliters, which it plans to complete six months ahead of schedule, in June 2016. The company intends to voluntarily complete an additional 5 million hectoliter expansion by 2017. In addition, Constellation is busy expanding a glass production facility adjacent to its Nava plant, which it owns through a joint venture with glass maker Owens-Illinois Inc (NYSE:OI). This will increase operating profits, as it will allow Constellation the greatest degree of control over both its beer production and bottling processes. Being mindful of these rising capital needs, let's look at the corporation's growth in total liabilities since 2013 against the concurrent change in the debt-to-equity ratio. The trend lines below may surprise you. 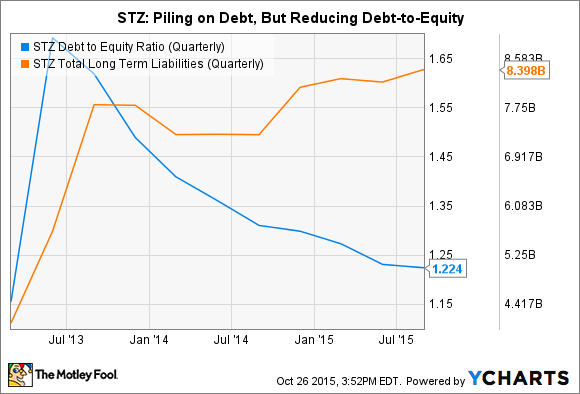 STZ Debt to Equity Ratio (Quarterly) data by YCharts. How does a company more than double its debt in the space of less than three years, while simultaneously reducing its debt-to-equity ratio? The answer is a bit of a throwback in this day and age. Constellation Brands is enjoying high profits and phenomenal cash flow from its new beer business, but it's keeping those profits on the balance sheet. In other words, retained earnings, the accumulation of each year's profits, aren't subsequently leaving the equity account through cash disbursements to shareholders and share buybacks. The company only started paying a dividend this year, and that at a current yield of less than 1%. And management hasn't repurchased shares since 2012. So, equity is growing, and at a faster rate than debt, as Constellation holds its profits in-house. And remember, every dollar of equity, if not distributed, can be traced to the net balance of assets over liabilities. So the tangible book value of Constellation Brands is also growing, in the form of additions to its brewing and bottling capacity, and new acquisitions such as the purchase of Pinot Noir specialist Meiomi this summer. It's currently in vogue for corporations to leverage their balance sheets only in the interests of distributing cash to investors. Shareholders in Constellation Brands haven't received the proceeds of any borrowings. But they have seen a phenomenal rise in their stock through management's old-fashioned use of debt -- the kind that's used to expand the potential for economic profits. Recently, S&P Capital Markets I.Q. predicted that total payouts of dividends and share repurchases among S&P 500 companies would reach $1 trillion in 2015. Constellation Brands is one of those 500 companies. Its contribution to this mind-boggling total so far this fiscal year, after accounting for net share issuances for stock award purposes, stands at a flimsy $87 million. This may be out of step with the current vogue of capital return at all costs, but given the company's recent stock chart, it's hard to argue with the way Constellation puts its profits to work.